I've been working on some embroidery designs for a commissioned embroidery project recently. Birds have been the chosen theme, and although I'm really not much of an artist - I eventually sketched out some cute little birdie's, all of which look rather plump! It seems there's no such thing as delicate skinny birds in my imagination! ;) The floral background is a new vintage sheet I got last week! I also finished up two more farmer's wife blocks this morning before work. I have been neglecting my FWQ for so long! It was great to get back into the swing of it yesterday. Now I have a good selection of 1930's reproduction prints in my stash it's becoming a lot easier to make up the blocks carrying on with my vintage'y vibe. What sweet little birds. And I love those Farmer's Wife blocks! Great colors. Such sweet little birdies! You should join us on Stitching Sundays over at Chrissie Crafts blog and link up - it's lovely to see what everyone else is stitching too. 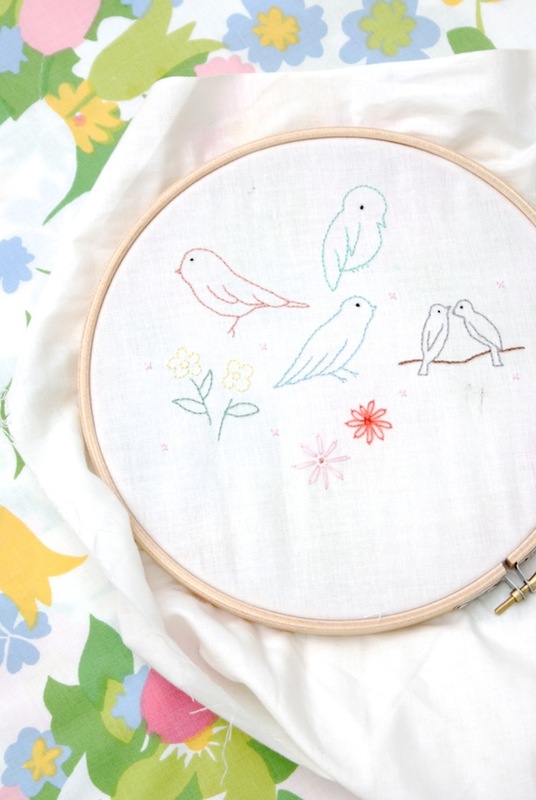 Love your little birdies, and your blocks, and your fabric. Yeah, I like everything you have here!! Love Briar Rose. I'm thinking about getting some myself. That vintage sheet looks like is straight out of Cath Kidston!! I love those birdies, can't wait to see what they become! I have to say, I'd never dare use Nana's pot holder! They are far to pretty!! I love the yellows in your FW blocks! And the DO have a vintage feel! I am in love with those birds! Sweet embroidered plumb birds... if I was to attempt such a thing they'd probably resemble another species altogether! Oh wow, how sweet are those birds!